DIY - Lake Ice Melt fundraiser! or three for $10. Tickets containing guesses for the fundraiser are stored in a sealed container. Alternative 1: An annual barrel-on-the-lake fundraiser is held to benefit the Alta Lake School in Whistler, British Columbia. 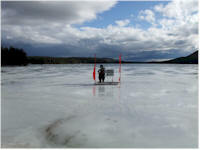 Every winter, a barrel is placed out on a frozen Alta Lake and residents purchase tickets, filling in the date and time when they think the ice will melt and the barrel will fall in. When spring comes and the barrel floats past a certain point, the person who guessed the closest time wins. The proceeds are split 50-50 between the school and the lucky guesser. Alternative 2: The Bridgton Community Center’s annual fundraiser on Moose Pond has a new mascot this year. IC is a colorful snowman that is highly visible as you cross the causeway and will determine when ice out comes to the Pond. Entrants can try to win one-half of the net proceeds by predicting the correct date. Tickets are available at a number of locations around Bridgton including Beth’s Kitchen Cafe. 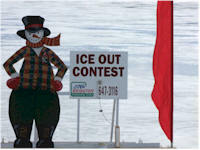 For complete contest rules and previous ice out dates, please contact the Bridgton Community Center.